Your wedding cake doesn’t have to be white or ivory with pretty finishing touches. If, for instance, you’re getting married at a venue which is steeped in history (Merchant Taylors Hall, Threadneedle Street, in the City of London or Leez Priory in Essex for example) go for something dramatic. There are a lot of wedding cakes out there at the moment that are finished with edible gold or silver leaf, edible sequins or pearl or gold shimmer. I’m working on a new wedding cake design at the moment which meets the criteria. 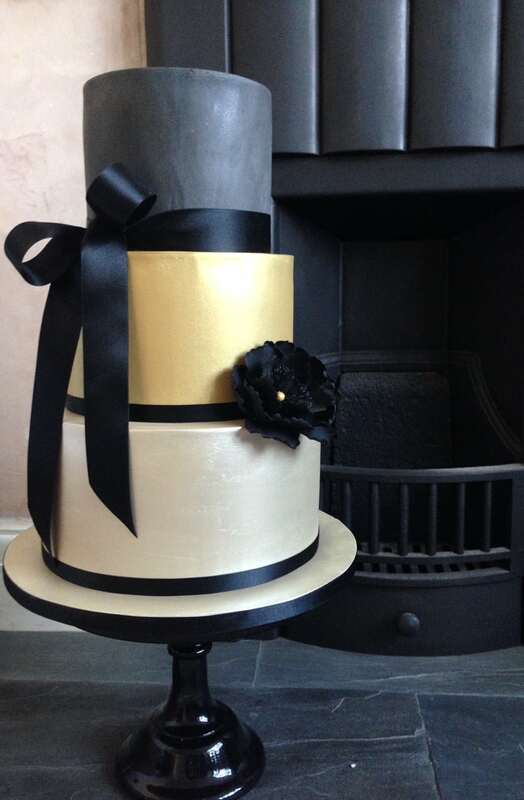 “Gabriella” is a 3 tier black, gold and platinum wedding cake with just one single large black peony style sugar flower. Quite simple in design but dramatic all the same because of the colours.